According to the National Association of Home Builders (NAHB) April is New Home Month. April is a great time to buy a new home in Woodbury, MN and an even better time to buy a newly constructed home that will save you all kinds of maintenance expenses. One of the many benefits of newly built homes is the savings that come from reduced energy and maintenance costs. All of the Michael Lee Inc. homes are brand new which means they are also eco friendly. Having an eco friendly, new home means your costs for maintenance are considerably lower than with an older home. Want proof that new construction homes are more energy efficient with lower maintenance costs? Take a look at the data from the 2009 American Housing Survey (the AHS classifies new construction as homes no more than four years old). 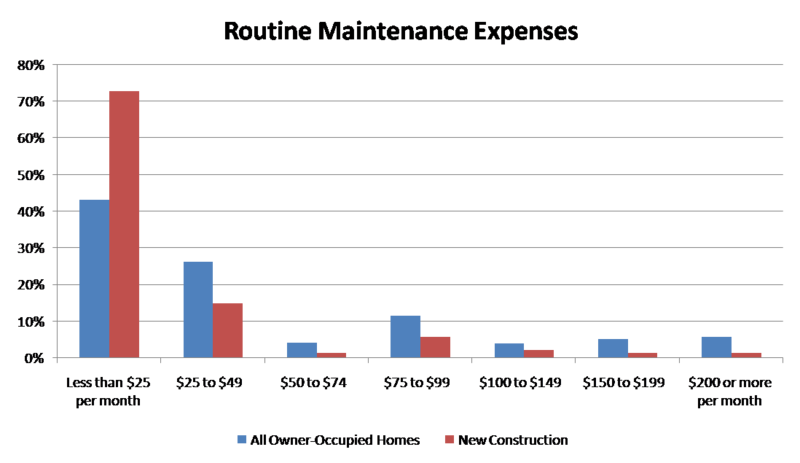 For routine maintenance expenses, 26% of all homeowners spent $100 or more a month on various maintenance costs. However, only 11% of owners of newly constructed homes spent this amount. In fact, 73% of new homeowners spent less than $25 a month on routine maintenance costs. For other energy expenses the findings were nearly the same. On a median per square foot basis, homeowners spent 78 cents per square foot per year on electricity. Owners of new homes spent 65 cents per square foot per year. When you consider the new technology being employed in windows, more efficient furnaces and air conditions and that more and more homes are using Energy Star Certified appliances it’s easy to see why a new home would cost less to maintain. Not only are the newer eco friendly products more efficient, more durable and longer lasting but they are also usually more quiet and considerably more attractive than in the past. A brand new, energy efficient refrigerator is more than just a place to keep your food cold, it is also the focal point of the kitchen. For homes with piped gas, homeowners spent on average 53 cents per square foot per year. Owners of new homes spent 38 cents per square foot per year. If you would like to learn more about saving money with a new home contact us and we’ll show you how our new homes can save you all kinds of money.